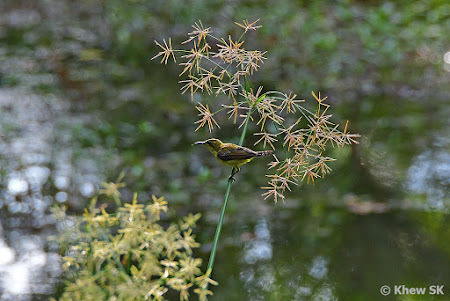 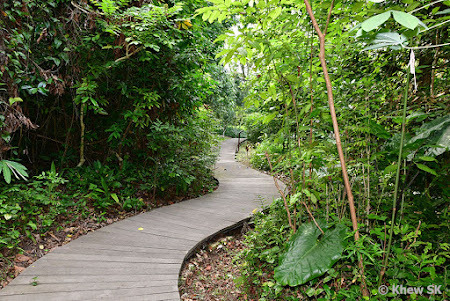 This weekend's blogpost features one of Singapore's nature parks, Windsor Nature Park. Located off Venus Drive in the Upper Thomson area, Windsor Nature Park is the sixth nature park in Singapore. 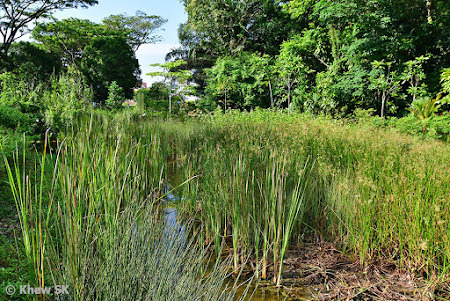 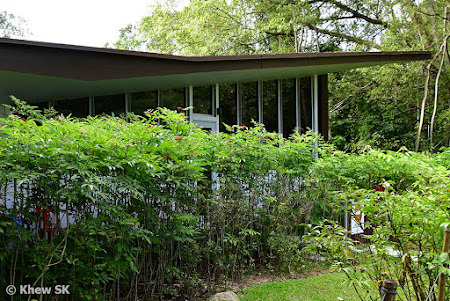 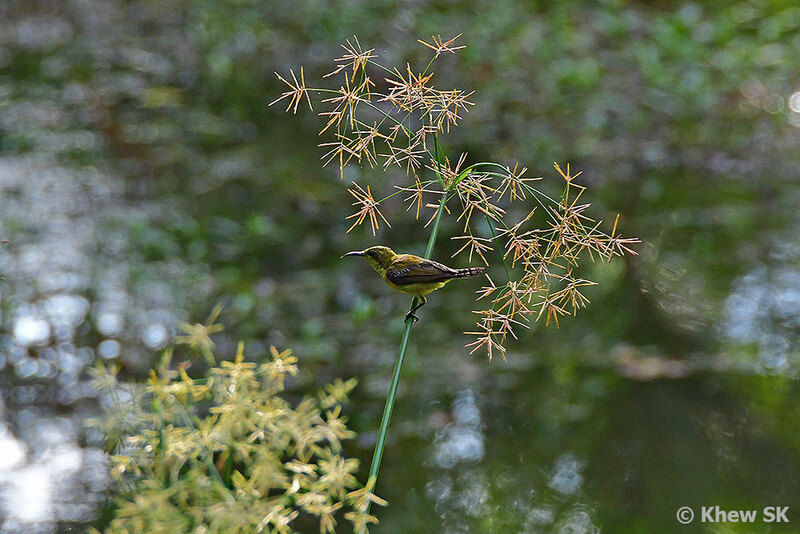 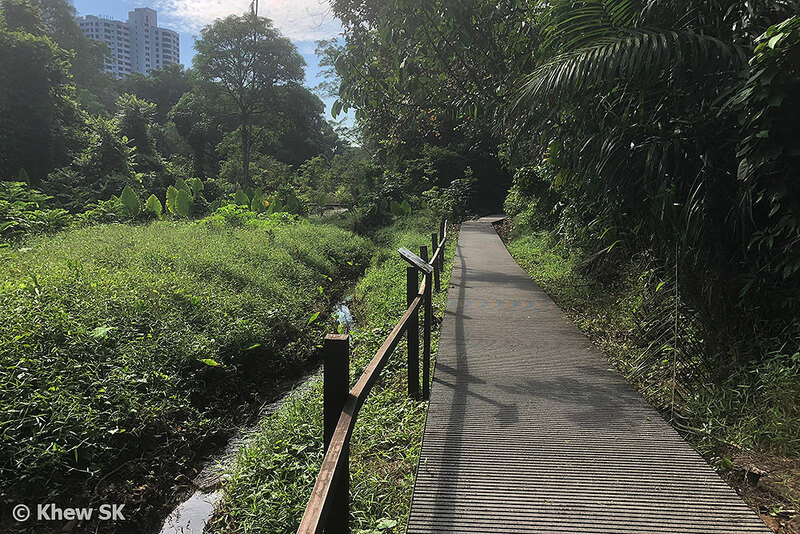 As part of a holistic conservation approach, nature parks have been established on the margins of the Central Catchment and Bukit Timah Nature Reserves to act as green buffers. 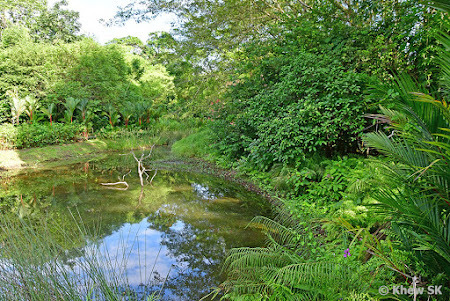 These nature parks buffer the Nature Reserves against developments that abut the Reserves. These parks will help to reduce visitorship pressure on the nature reserves by providing alternative venues for the public to enjoy nature-related activities. 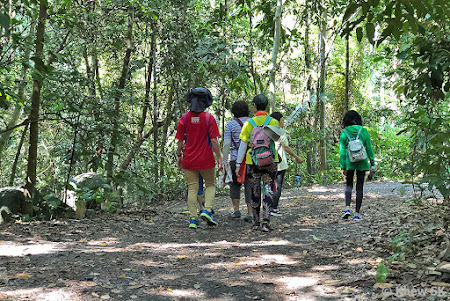 The habitats within these buffers are enhanced so that they remain rustic and forested, and at the same time, provide safe and convenient accessibility to visitors to these parks. 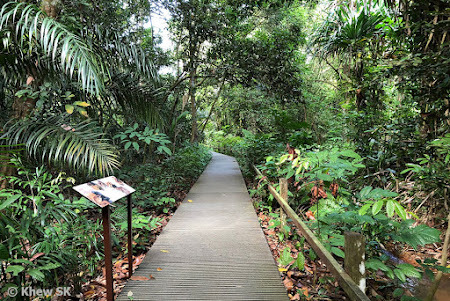 The 75-Ha Windsor Nature Park is located at the south-eastern boundary of the Central Catchment Nature Reserves (CCNR) and abuts the MacRitchie Reservoir Park. The entrance to Windsor NP is via Venus Drive, just off Upper Thomson Road. There is a 112-lot carpark for visitors who drive, and a conveniently located sheltered drop-off point along Venus Drive. 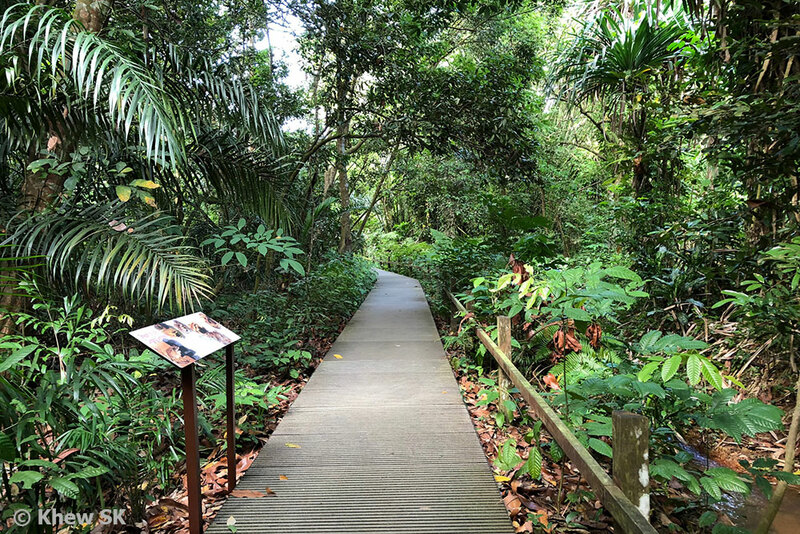 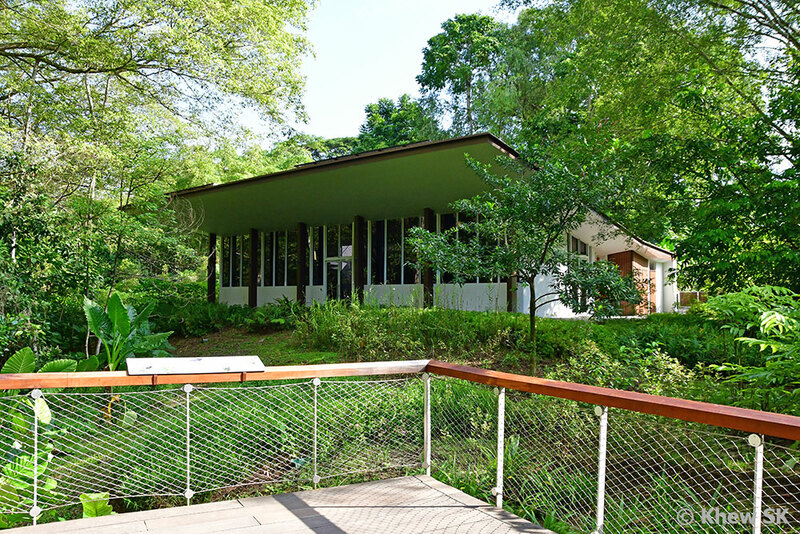 The trails from Windsor Nature Park intersects with the trails from MacRitchie Reservoir Park and is popular with nature and exercise enthusiasts. 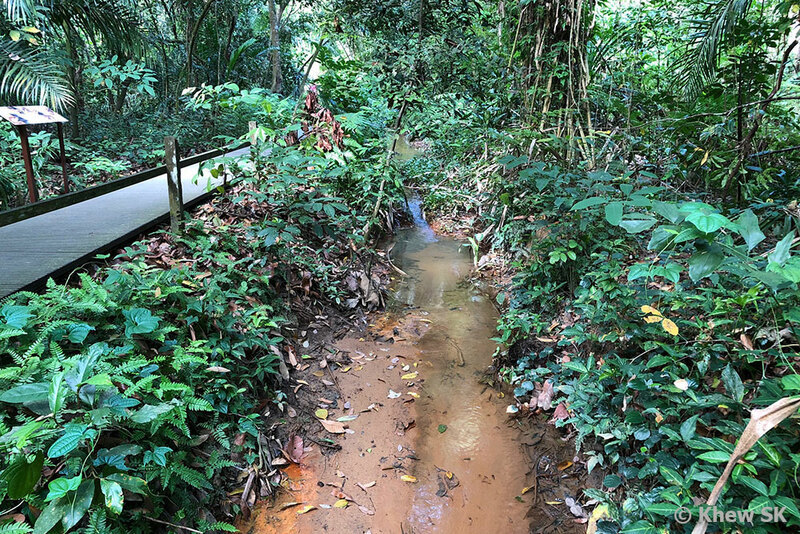 I recall that, over 10 years ago, this area that butterfly and bird watchers refer to as Venus Drive, was a favourite place to look for forest biodiversity and rarities. 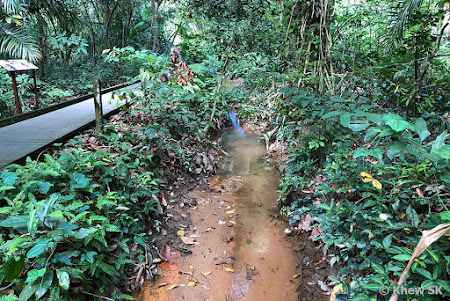 Back then, the area was rustic and undeveloped and there were few visitors. 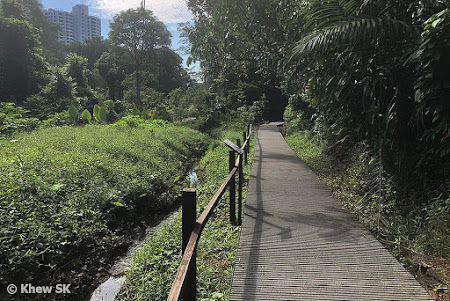 The area was an access point to Sime Forest through the Singapore Island Country Club and we used to hike long distances to reach the nature reserves. Today, the area is enhanced to provide proper boardwalks and safe accessibility to visitors. 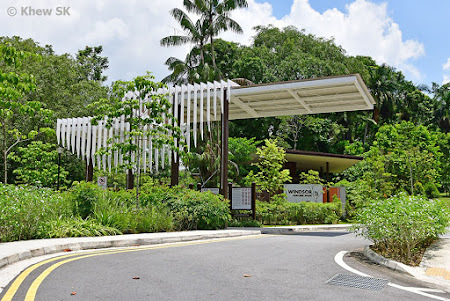 NParks' Conservation Division's Central Nature Reserve's office is also located here, where staff are on-site to conduct research, administrative work and field studies in the CCNR. Public amenities like restrooms, water-coolers, a gathering area and rest spots form part of the entrance facilities at Windsor Nature Park's visitor centre. 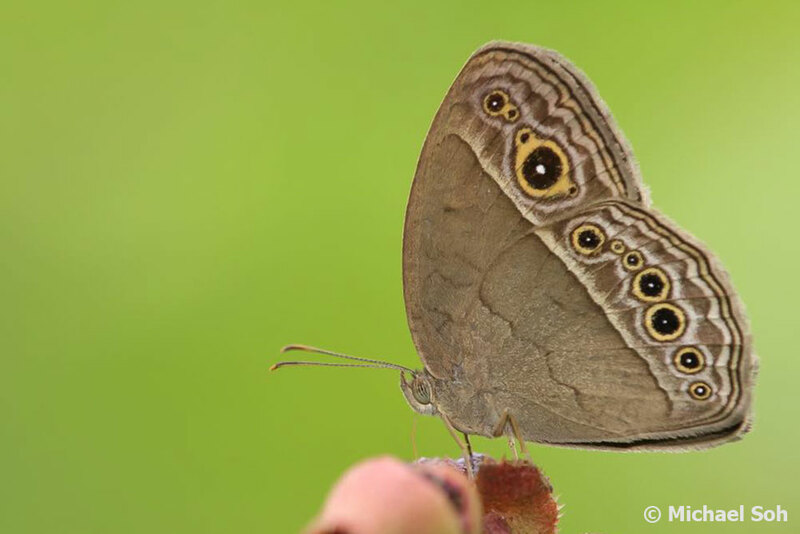 Biodiversity abound in the nature parks, so keep a lookout for all sorts of animals and insects around you! 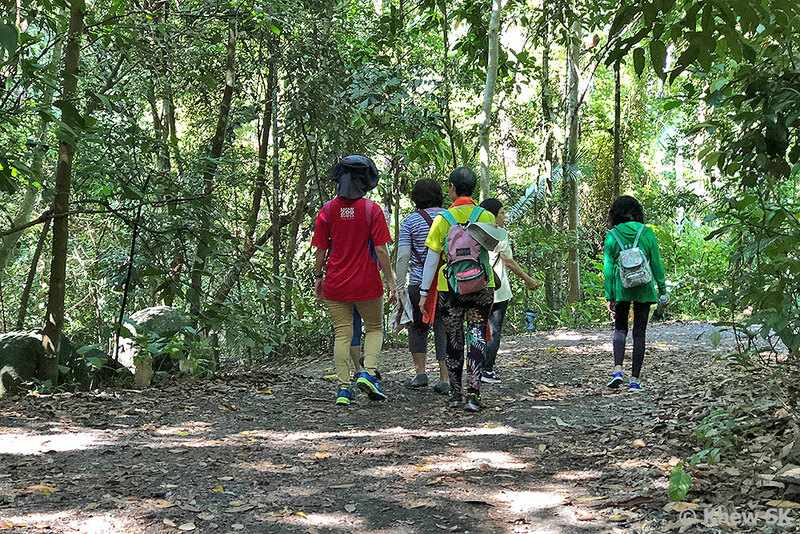 The enhanced amenities and better accessibility have made Windsor NP a popular park with resident local visitors, nature enthusiasts, hikers and school groups out on educational tours. 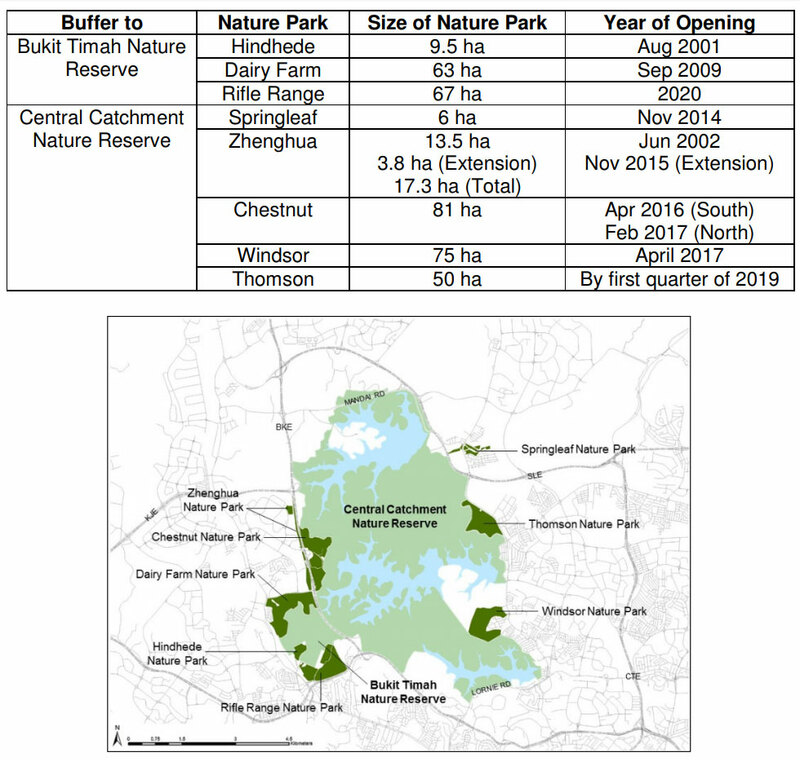 On my recent visit to Windsor NP on a weekday, I was surprised to see that the carpark was already about 70% full! There were many visitors around, and throughout my 3-hour walk around the park and into the MacRitchie area, I could hardly be alone for more than 5 minutes before meeting another visitor along the paths and boardwalks. The entrance area of Windsor NP features a marshy wetland area where forest streams drain into. 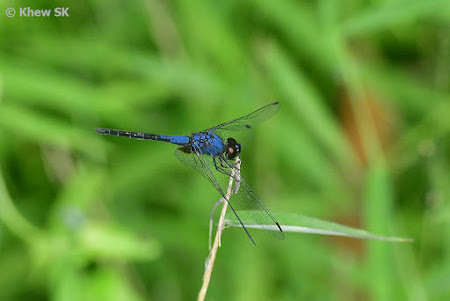 This area is great for dragonflies and teeming with many different species of our local Odonata. 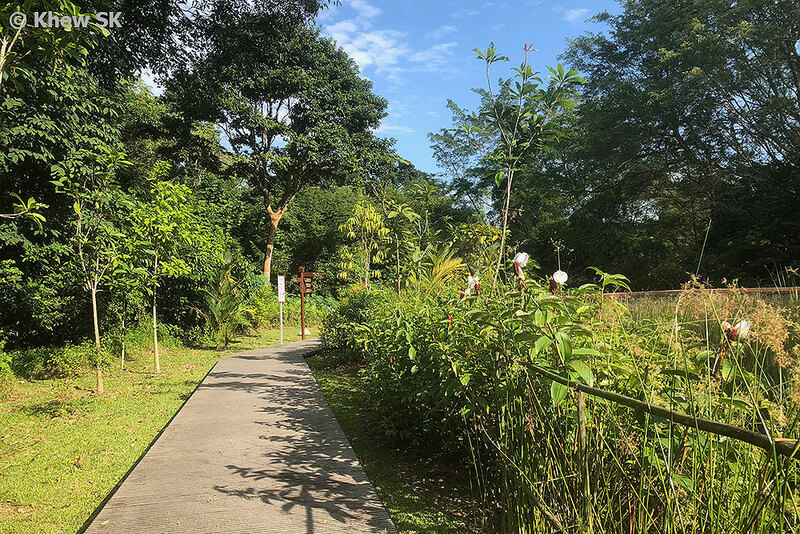 The landscaping around the NParks office and the public facilities includes many butterfly nectaring plants. 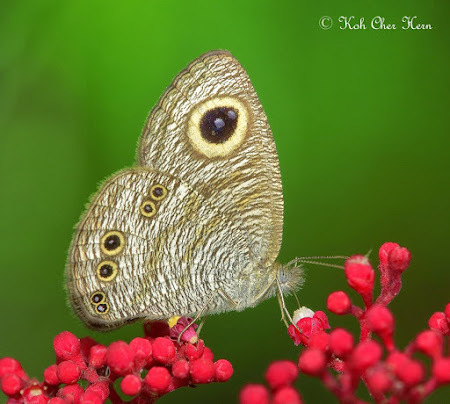 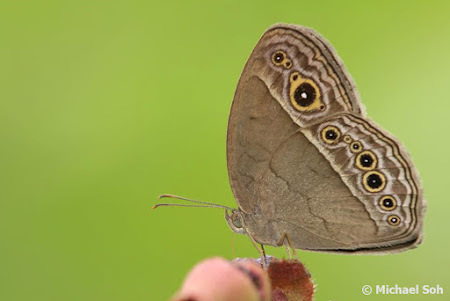 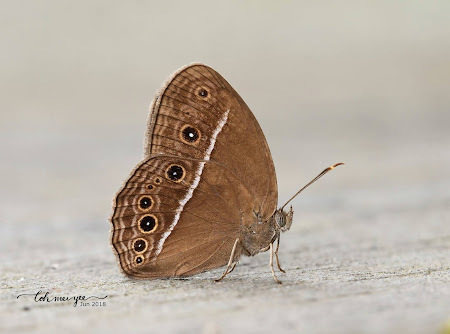 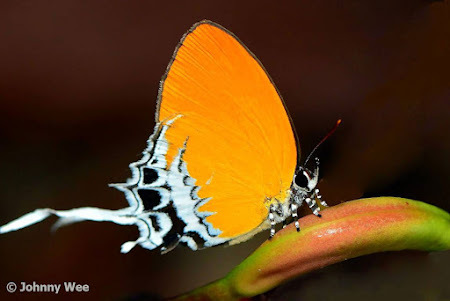 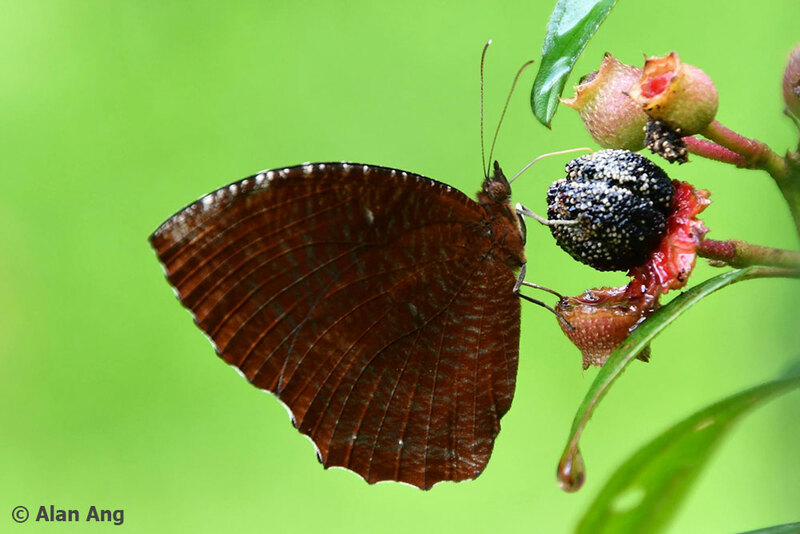 On good days, a butterfly watcher should be able to see no fewer than 10 different species in the area, usually at the flowers of the Red Tree Shrub (Leea rubra). 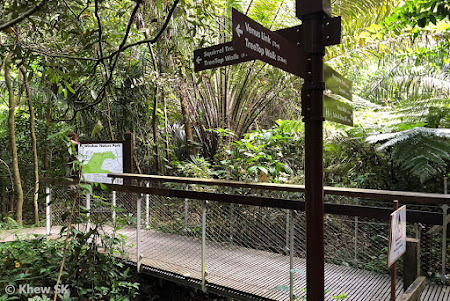 The boardwalks lead a visitor towards the specially curated Hanguana Trail and the Drongo Trail. The Hanguana Trail is lined with rare native plants, some of which are named after Singapore. The Drongo Trail features a sub-canopy walk where visitors can catch a glimpse of the fauna that are found under the canopy level, in addition to examining the understorey of the regenerating secondary forest. 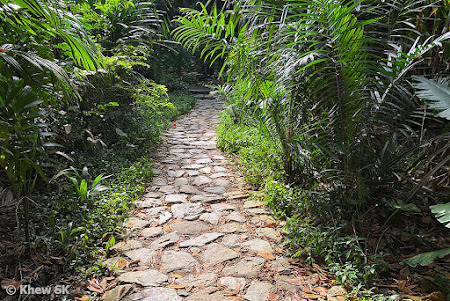 There are adequate signage and wayfinding is simple and straightforward. 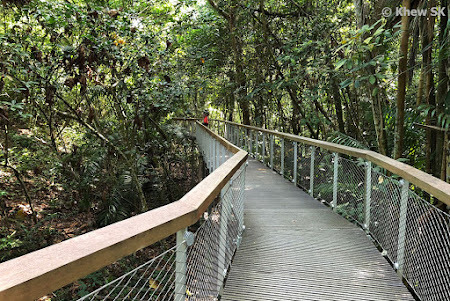 Many visitors walk from the entrance at Windsor NP to the TreeTop Walk, which is slightly over 2.5km away. 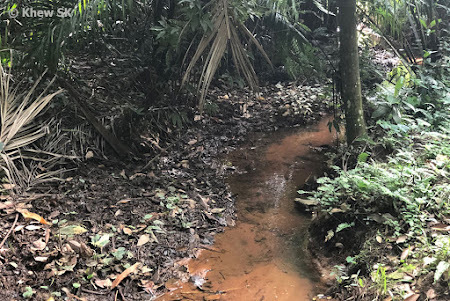 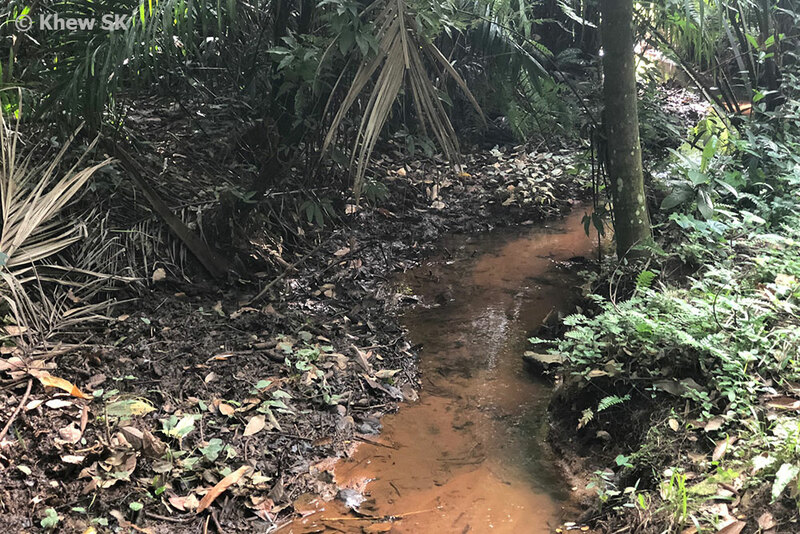 Secondary trails like the Squirrel Trail, Venus Link and Venus Loop also allow visitors to experience different parts of the nature park featuring a variety of habitats around forest streams, thick vegetation and open grasslands. 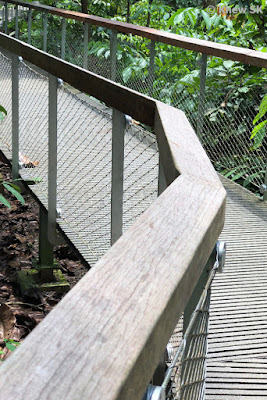 A simple sloping detail of the timber handrail minimises problems like visitors sitting on these handrails, leaving litter on top of them, and eliminates leaf litter and twigs from collecting on the handrails. As a visitor walks along the boardwalk and trails, one should look at some of the design details that were incorporated into the amenities at the nature park. 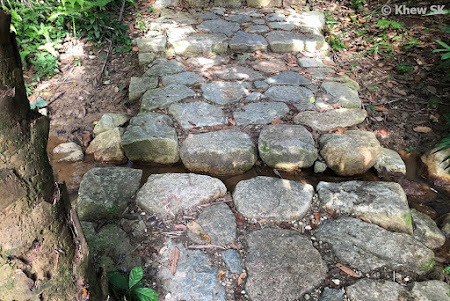 A casual observer may not notice these design details. 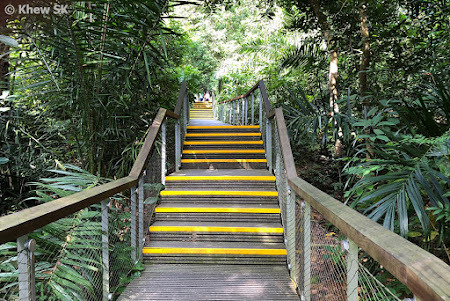 One of these, is the simple handrail on the boardwalk. 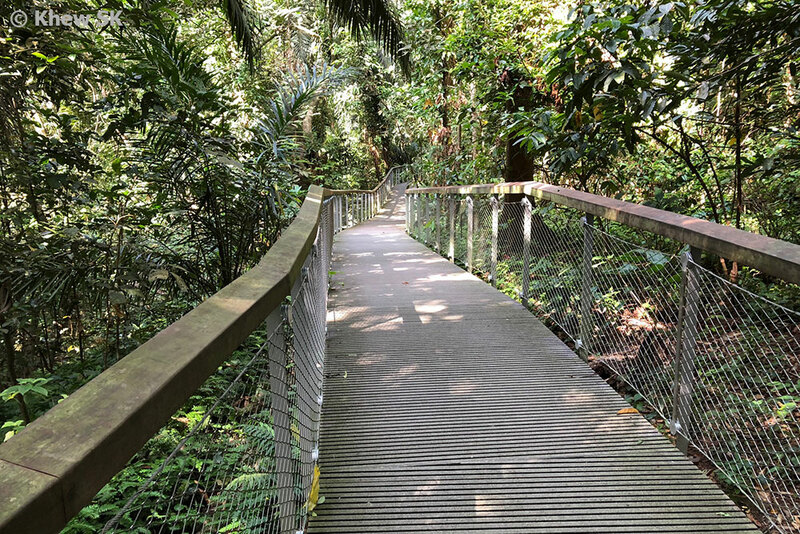 The chamfered top surface of the timber handrail may appear simple, but it serves to prevent visitors from sitting comfortably on the handrail and thereby creating a safety concern. 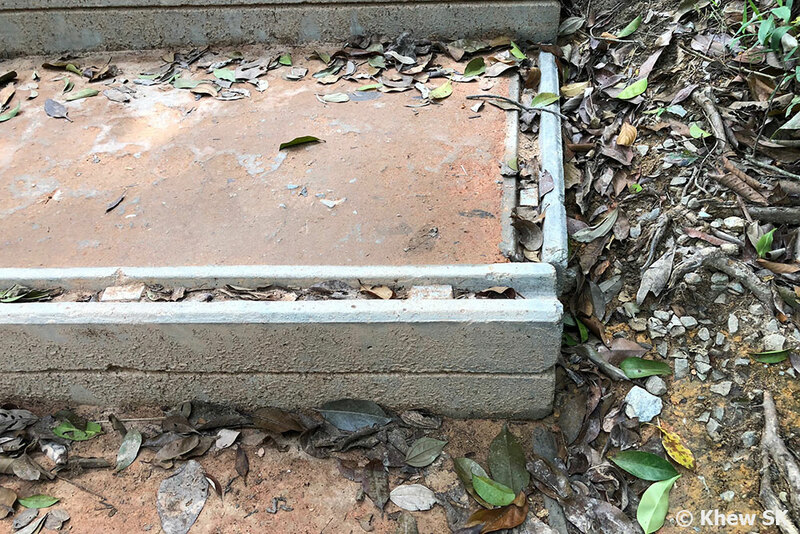 The sloping surface also minimises litter like cups and other things from being left behind by inconsiderate visitors as these objects will just slide off. Leaves and other natural litter will also not collect on the top of the handrail. 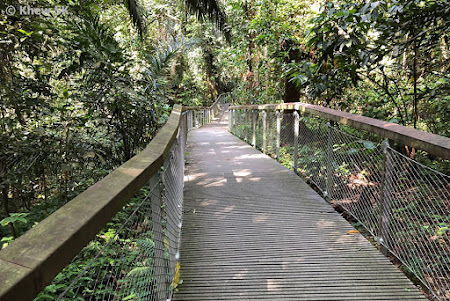 Leaving a gap between the safety mesh and the boardwalk makes for easy maintenance by the sweepers to keep the boardwalk free of leaves. 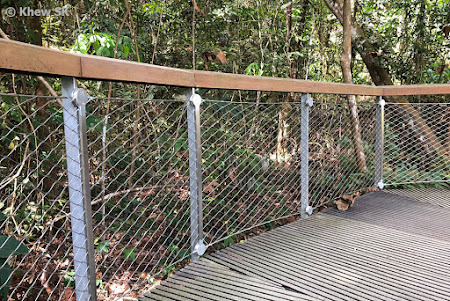 The stainless steel mesh is also designed to be panelised to allow for easy replacement of damaged sections or for maintenance. A 100mm gap is provided at the bottom of the safety mesh to allow the cleaner to sweep leaves and other forest litter off the boardwalk easily. 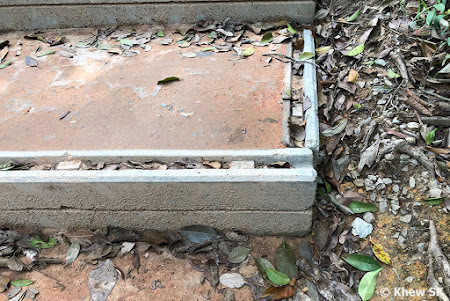 A detail that is very important for housekeeping! Creating a different walking experience with granite rocks and at the same time allowing water to flow across on rainy days during the wet season. 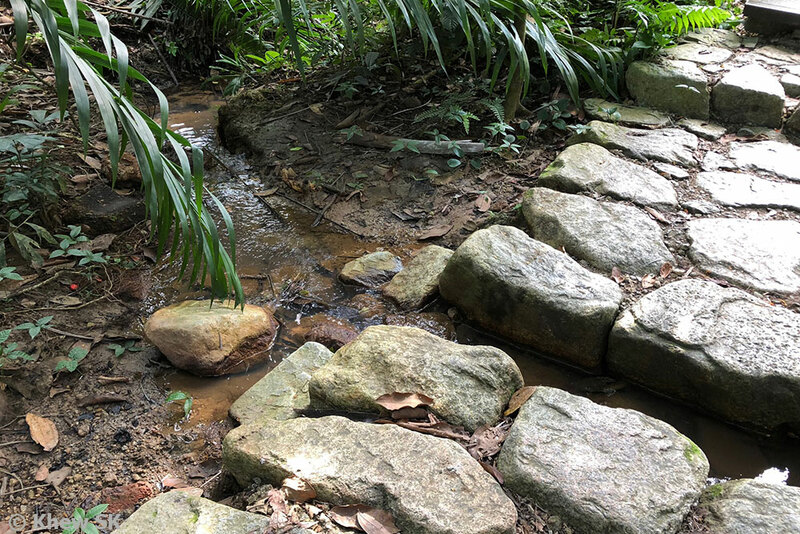 Along the trails where water flow is likely to be impeded by the trail, the footpaths have been designed with granite rocks as a bioswale to allow water to pass through, creating a different experience for visitors whilst allowing water to flow downstream on rainy days. 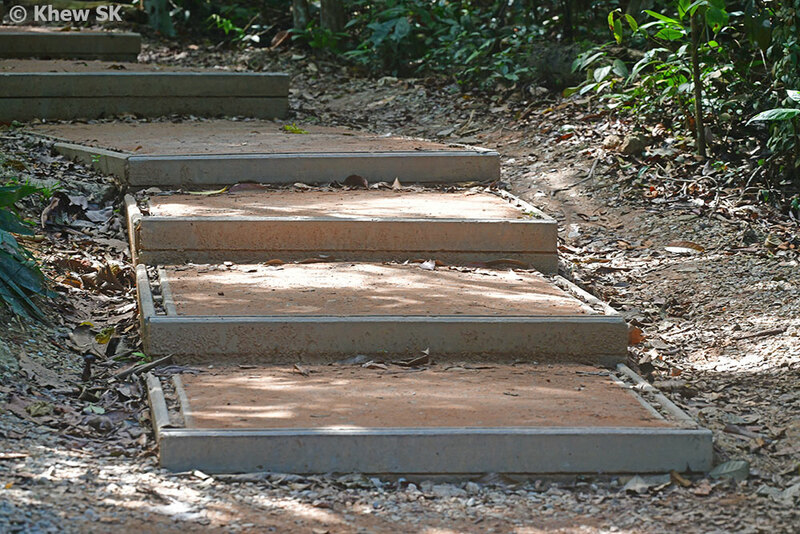 Where steep slopes require some form of steps, a simple and cost-effective design of using precast blocks secured with galvanised soil spikes or crampons, and then filled with compacted earth solves the problem. 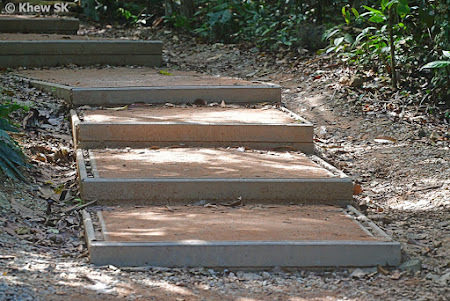 This also eliminates the need to construct expensive and high maintenance concrete steps in the nature reserves. 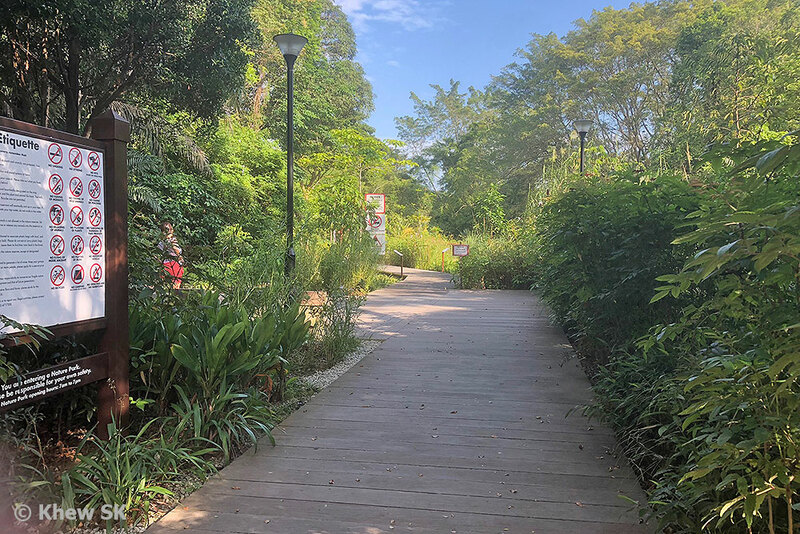 Kudos to NParks Conservation Division (in particular, Sharon Chan) and the architects for paying attention to some of these details in the design of the nature park's amenities and facilities. 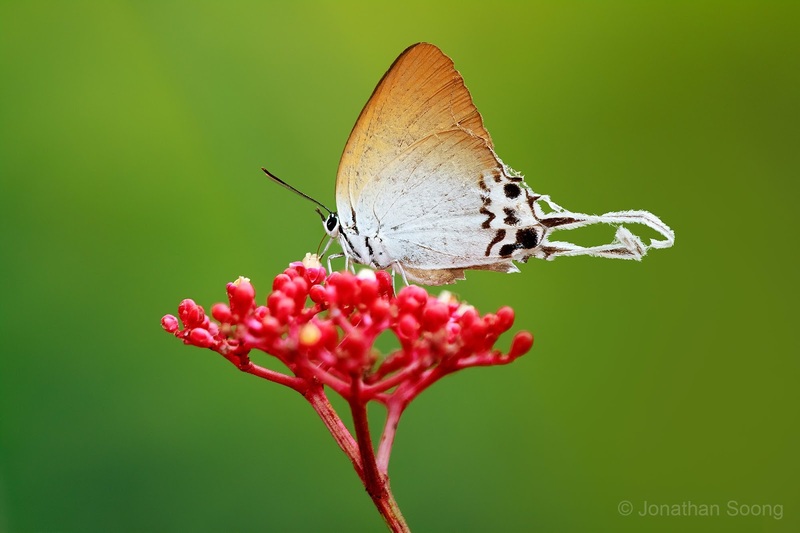 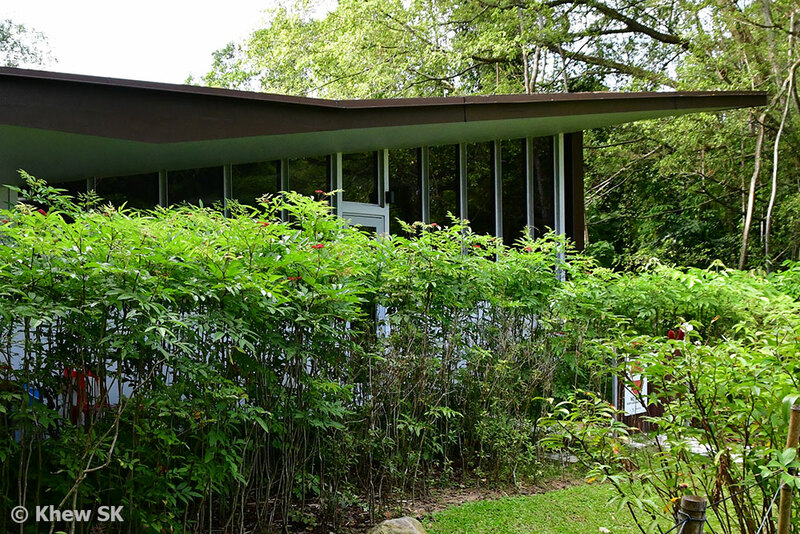 At the entrance area, look out for butterflies at the Red Tree Shrubs which line the trails and adjacent to the buildings. A favourite nectaring plant for butterflies, the attractive red flowers of this plant will often be visited by many species of butterflies. 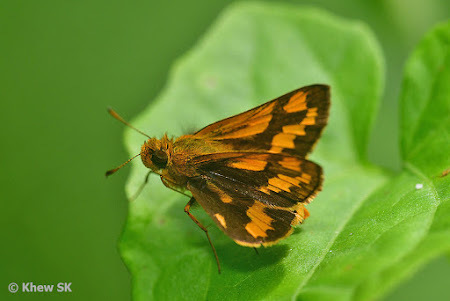 The open grassy areas along the trails are also good hunting grounds for various Satyrinae species like the Bush Browns, Rings and many Hesperiidae sunbathing in the early morning hours of the day. 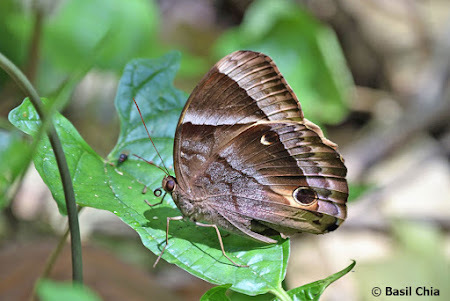 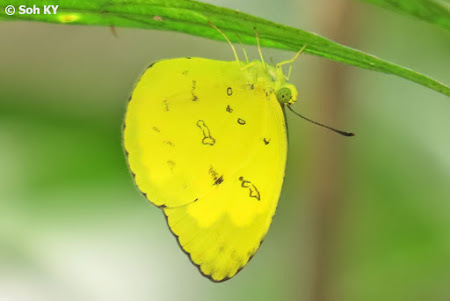 Along the boardwalk and forest trails, one can encounter butterflies like the Branded Imperial, Malay Viscount, Archduke, Saturn, Common Faun and Dark Blue Jungle Glory. 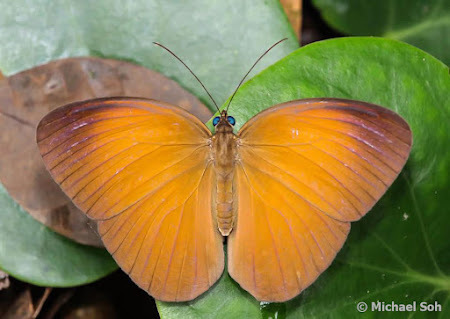 Mostly forest-dependent species, these butterflies are often seen foraging amongst leaf litter and muddy forest paths. By Car : From Upper Thomson Road. 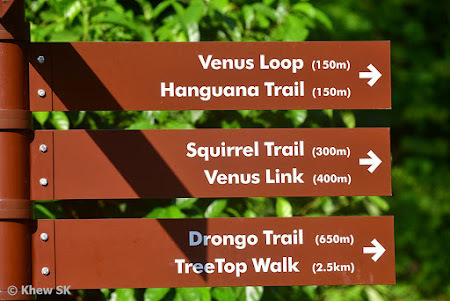 turn into Venus Drive. The carpark entrance is quite obvious. 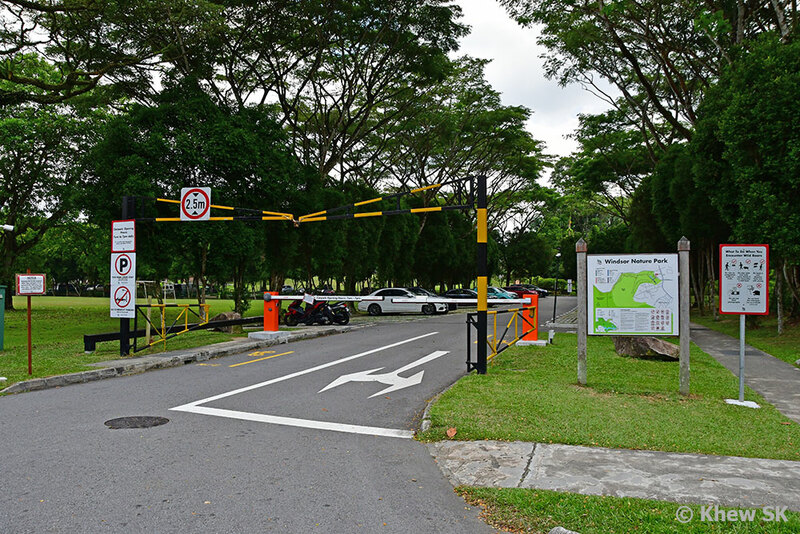 The gantry closes at 7pm and cars parked at the carpark will not be able to exit. 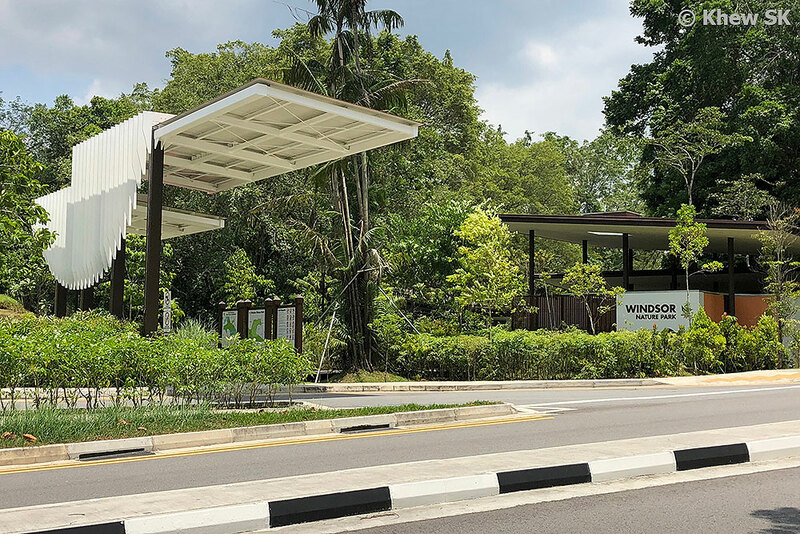 However, during the operating hours of 7am-7pm, carparking is free! 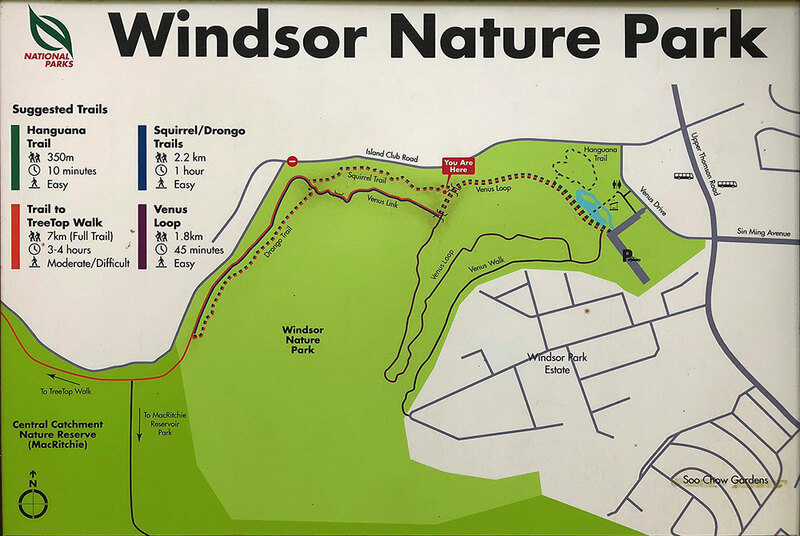 Note however, that due to the popularity of Windsor Nature Park on weekends, finding an available parking lot may be a challenge.